I was born in Washington County Virginia, on the 4th of July, 1805, and am a relative of Pres. Polk. I attended the common schools of the day. When scarcely twenty years of age I became imbued with that restless spirit of adventure that has since been a marked characteristic of my life, and left my home for the then comparatively unknown West. St. Louis was at that time the center of the fur trade of the United States, and when I reached that city I engaged with the Rocky Mountain Fur Company, to work in their warehouses. I was placed in the cellar by the celebrated William Sublette with several other green hands to "rum the beaver," which operation consisted of spreading the skins out upon the cellar floor and sprinkling them with rum for preservation. Sublette left us with the remark "Don't you boys get tight now," at which idea we all laughed. Soon the fumes of the rum began to affect us and it was not long before we were reeling around the room apparently helplessly drunk. Sublette then put in an appearance, and pretended to be angry with us "Can't I leave you here alone for a few minutes, without your getting drunk? Do you think that this is the kind of men I want around me? Here!" said he "drink this?" and he drew a cup from the barrel. This had the effect of making us sober again and Sublette again left us with the remark "The next time you rum the beaver, just rum yourselves first." In 1829, I went to Lexington, Missouri, and worked in a steam saw-mill erected by my brother, Hiram C. Meek, then a merchant of that place. In the spring of 1830, I joined a party being taken to the mountains by William Sublette and Robert Campell, and then commenced that wild life of adventure which I led so many years. The great annual meeting of the trappers that season was held at the favorite rendezvous on Green River, and four rival companies were then competing for the patronage of the Indians and free trappers, the Rocky Mountain Co., the American Co., the Hudson Bay Co. and an independent company. It was the custom to send trapping parties or brigades, in different directions to trap, all of them assembling the next summer at some rendezvous previously agreed upon. I joined the brigade of Milton Sublette, and went to the Lewis fork of the Columbia River and wintered at Blackfoot Lake. In the fall of 1831 I was again with Milton Sublette and trapped in the Black Hills, near where Fort Larimie was afterwards built, on the head waters of the Platte. The winter was spent on Powder river, and in the spring we went to Wind river and trapped on that stream, the Yellowstone, Mussel Shell river, and back through Jackson's Hole to Wind river, the rendezvous being at the mouth of Tar, or Popyoisa, river, a tributary of that stream. In the fall of 1832 I went to the Blackfoot country with Bridger's brigade; crossed to Powder and Yellowstone, and then to the Missouri; went up that stream to Three Forks, and up the lefthand fork to the head of Big Gray Bull river, a tributary of the Yellowstone; then to Green River, and finally wintered on Snake River, where Fort Hall was afterwards built. In the spring we trapped Salmon, Snake and Point Neuf, and then went to Green River rendezvous. There I hired to Capt. B. L. E. Bonneville to accompany an expedition of 34 men, under Joseph Walker, to explore the Great Salt Lake. We got too far West, and finally started down the Mary's, or Humboldt, river for California, over a country entirely unknown to trappers. "Law sakes! Mr. Meek, didn't you never get killed by none of them Indians and bears?" "Oh, yes, madam," said I gravely, "I was frequently killed." Going back to Laramie with the express, I made the spring hunt with Trapp's brigade, and in July went as wagon-master of the train of ox-teams, taking the furs to Independence. I spent the winter in St. Louis, and in the spring of 1840 engaged with McGoffin Bros. to take a train of wagons to Santa Fe and Chihuahua. I wintered in the latter place, and in the winter of 1841 joined a party of American mountaineers under James Kirke, engaged by the Governor of Chihuahua to fight the Apaches. Several battles were fought, but in the fall a new governor was appointed, who thought Mexican troops should fight Mexican battles, and the Americans were recalled. We came in with fifteen thousand head of captured stock, for which we received two and one-half dollars each, according to agreement. I again spent the winter there, and in March, 1842, returned to Independence, where I found seventeen families waiting to go to Oregon, who engaged me as a guide. I took them as far as Green river, where they were overtaken by Fitzpatrick's brigade on the way to Fort Hall, and several of the families cut up their wagons and made packsaddles, and packing their effects on their animals, went along with Fitzpatrick. The balance of the wagons I conducted safely to Fort Hall, and by going through a new route, known as "Meek's and Sublette's cut-off," I arrived there the same day the others did, much to their surprise. The wagons were left there, and the goods were then packed upon the animals. They went down the Snake, and by Boise river, to its mouth, crossed Snake again, down to Brule or Burnt river, up to Powder and Grand Ronde, crossed the Blue Mountains at Jason Lee's encampment to the Umatilla, down the Columbia and to the Dalles, then by the Mount Hood trail to Oregon City, which was laid out that fall by L. W. Hastings, of this train, as agent of Dr. McLaughlin, I carrying the chain. In the spring of 1843, I piloted a few of those who had become dissatisfied with Oregon, to California, over the Old Hudson Bay trail, meeting Capt. Joe Walker and others in Rogue River Valley, with two thousand head of cattle, coming from California. I went to Sutter's fort and Monterey, where l spent the winter. Here I met Capt. Smith, with the trading vessel George and Henry, of Baltimore, who persuaded me to start on a voyage with him around the world. When we reached Valparaiso, Smith received advices that called him at once to Baltimore, and he and I started in a packet for the Isthmus. We reached Guaquil, Colombia, where I nearly died with the yellow fever, then to Panama, where we took the vessel for New York. Arriving there in July, 1844, I went to Pittsburg with some Santa Fe traders, then to my old home in Virginia, where I found an absence of seventeen years had made me almost a stranger. In March, 1845, I went to New Orleans and then up the river to St. Louis, where I got letters of recommendation from Fitzpatrick, Wm. Sublette and Rob. Campbell, which secured me the position as guide to the immense emigrant train of 480 wagons then preparing to go to Oregon. We started on the 11th of May, 1845, on which day I first saw Elizabeth Schoonover, whom I married a week later. Arriving at Fort Hall, one-third of the train under Wm. 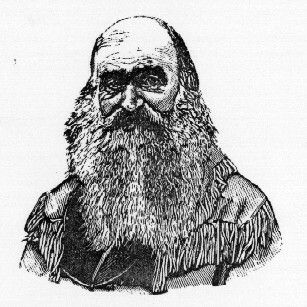 B. Ide, of bear flag notoriety, went to California, guided by the old trapper, Greenwood. The remainder, I conducted safely to Oregon, the first large train of wagons ever taken there. I lived in Linn City and Oregon City till the spring of 1848, when I went with my wife and child to San Francisco. In October of that year I went to the mines at Coloma, and in January, 1849, opened a butcher shop there. That summer my wife went to Oregon and in December, 1850, I followed. In the spring of 1851, I started for Scott river, but stopped at Yreka and mined till October, when I returned with $6000. In the spring I went by sea to San Francisco with my family and took a stock of goods to Coloma, which I sold and went to mining. The mine caved in and I sold out and went to Santa Cruz and opened a butcher shop. While here I paid $3,400 for a Mexican grant near Watsonville, which the former owner's heirs got away from me again in the courts. Being now poor again, I went to Frazer river in the excitement of 1858, but returned poorer than before. In 1859 I went to Jackson, Amador County, and mined until the death of my wife in 1865. Taking my youngest child, George, then four years of age, I went in search of my wife's father, and found him at Humboldt Bay. In the spring of 1867 I took a train of twenty-two wagons, loaded with quartz machinery from Sacramento to South Boise, Idaho, and then went to the ranch of my brother, the well-known Joe Meek, near Portland, where I spent the winter. In 1868 I piloted a party of thirty men to Melheur river, where rumor had located the famous Blue Bucket diggings. This wild-goose chase being over, I engaged as wagon master for the government during the Bannock war, and soon became scout for Gen. Cook, finding in a few days the hiding place of the Indians, Sugar Loaf and Crater Hole which the troops had sought in vain all summer. The war being ended by the battle that took place there, I went to Silver City, Idaho, thence by stage to Winnemucca, and by rail to Sacramento. I spent the winter in Amador county, and the summer at Humboldt Bay, the next winter in Amador, and then lived in Truckee till the fall of 1871. Being now advanced in years and having lost all the money my good fortune and hard labor had brought me, I was compelled to take to the mountains to secure a livelihood. I went to Red Bluff, bought animals and traps and have ever since been trapping the waters of Sacramento, Pit, McLeod, Scott, Trinity and other rivers of northern California. I make the house of Josiah Doll, in Scott Valley, my headquarters, and from there range through the mountains with my son George, or as guide to hunting parties.